In my almost 50-year cycling career as a competitor, coach and bike fitter, I have been able to observe cyclists of every level, style and ability. I have boiled all of this experience down to one basic fact: cyclists are athletes in every aspect, no different from swimmers, basketball players or track & field athletes. Our sport is much more than just ‘legs and lungs’. To ride effectively, one must think and act in unison with the bike, being the engine, the pilot, and the passenger – interchangeably and sometimes simultaneously. If we observe an elite cyclist in full flight, that athlete does not look like some powerful behemoth; no, that athlete looks supple, like a well-oiled machine. This is no accident…and all of us who ride can aspire to and most of us can achieve this status. But how? In the first of our 3 part series we discussed the nuances of high tech vs. low tech fittings, concluding that that each has its own merits, but in the end it’s the experience of the provider that counts most. In the second segment we dove into the requirements of an effective fit: power and comfort (our goal with all adjustments), and biomechanical balance, the methods to achieve these requirements include body work - the assessment and mobilization of athlete’s bodies to address each individual’s anatomical challenges. In this final installment I would like to push aside everything traditional about bike fitting and ask you to use your open-minded imagination in order to view fitting as an exploration of human performance-based science AND art. A previous article of mine we employ to open up muscles and soft tissue to align cycling-specific force vectors, which is the essence of power production and overall efficiency on the bike. The theme of athletic performance & improvement will be consistent throughout the rest of this article. I have often heard the phrase “Ultimate Fit” used to describe an “all new” process that delivers perfection inherent to that particular system. The implication is that not only will all our issues be addressed but we will instantly be transformed into more efficient cyclists; all our problems solved with a few turns of a wrench, based on this latest advancement. Such a plan should include specific types of therapeutic stretching and strengthening, targeting your specific issues before they become chronic. Only with this approach will maximum performance be achieved. Efficient power production is still the primary focus in a successful fit. The power-producing muscles shown in this diagram need to be free of impingement, stagnated scar tissue, and waste products. Soft tissue, especially older soft tissue is in need of regular ongoing therapy. One example of a key soft tissue area that sees abuse in cycling is the Illiotibial band, causing lateral quad, knee and hip pain and a splaying of the knee. Another example is the major muscle group of the posterior hip, or external rotators, perhaps the most important and problematic muscles in cycling. If these rotators are tight, the result is exacerbated deep hip pain and weak turnover of the gluteus maximus, medius and minimus, which are the most powerful muscles in the human body. Much has been written about the importance of core strength in cycling without much detail offered as to the precise role of the thirty plus anterior and posterior core muscles. The core essentially provides a base of stability. This base along with diaphragmatic breathing allows a systematic deeper focus on core muscles which have a stabilization effect in the body, thus allowing us to leverage more power from the major muscles, the glutes, quads and hamstrings. If the body is correctly aligned, the sacrum should be level, hips square and parallel during the pedal stroke. This requires the hips to be in a proper state of mobility, capable of motion-with-strength. Proper alignment and tracking is crucial to generating the efficient force needed to propel you forward; this can be measured by an experienced fitter. The purest essence of cycling involves utilizing the body’s two-levered lower limbs, your legs, to move a single-levered component of your bike’s drivetrain, your crank arm. Strength in this case does not mean strength like that of an Olympic power lifter. We look for efficiency and speed in the application of power, which first require us to optimize items 1 and 2 above. If we then balance these traits, we are well on the path to enabling a rider to be the most powerful that she or he can be. Let me explain further. Power from the down-stroke is produced by the extensor muscles, and the flexors do the lifting. If the cyclist is pedaling at 100 rpm, the transitional periods of extension and flexion are extremely brief. The transitional periods mentioned can lead to slight hesitations or “dead spots” in the stroke. This will serve to diminish the antagonistic (contract & relax or push/pull) action of hip flexion and eventually knock your pedal stroke out of balance. This is one reason why we strongly recommend you use your own bike on a trainer or rollers for the bulk of your indoor seasonal training vs. a spin bike, for example, which uses a free-flowing, loaded fly-wheel, which does not fully enable the efficient antagonistic action needed on a chain driven bike. Cycling by its nature is a forward momentum-producing, concentric exercise with virtually no lateral or eccentric loading taking place. Of course there are exceptions to this, including cyclocross and mountain biking, but for the most part we have nearly complete reliance on flexion and extension movements, virtually exclusively in the sagittal plane (only 1 of 3 planes of movement in the human body). As the activity increases in longevity and intensity, imbalances are more probable. The most obvious examples can be observed in the poor, stooped posture of ultra-distance racers. This is usually accompanied by pain in the lower back, the upper back and neck. Let me stress this in the strongest possible terms – These issues cannot be permanently addressed by the turn of a wrench or other adjustment to your bike. You MUST focus on your body first, then adjust the bike to match your capabilities. Field testing imbalances is often a therapeutic necessity if maximum cycling performance is to be achieved, maintained or re-established. Our favorite testing tool is the CompuTrainer’s SpinScan, which measures an array of muscle functions including torque and power. It also measures average torque angle, showing where you apply power in the stroke. 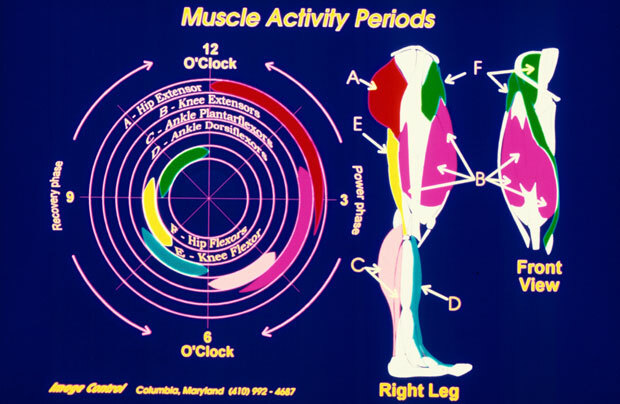 Both measurements split left and right muscle group usage, and are displayed on the polar graph. Alternatively, a power meter can also be creatively applied to test legs for output in Single Leg Drills (SLD). This can be used to detect output variations for left and right legs. An example of an effective protocol includes 2-3 sets of 30 to 45-second drills for left and right, then testing for power and/or heart rate. It should be noted that when the crank begins to “click” it is an obvious sign that the muscles have fatigued to the extent the exercise is no longer meaningful and therefore the interval training should be stopped or shortened. The correction procedure might include 10% more activity on the weaker leg with an appropriate rest interval to insure a strength gain. Everything one does off the bike affects what happens on the bike. Never think of stretching as something you have to do, rather think of it as your personal reward that will make you a better cyclist. You should look forward to stretching every day because it will help you maintain your ability to enjoy the sport you love. The best way to make the routine stick is to hit the floor upon waking and run through a brief core routine that will lead you into a simple wake up for the major muscles groups. You will feel better on the bike, with better concentric alignment, a more directed and powerful stroke and you will require less warm up time. When you first begin to feel the positive effects improved range of motion you will inevitably do more stretching and core work which is like money in the bank for powerful, efficient cycling. I include a detailed list of photographed stretches and accompanying strength exercises in chapter four of my book Mastering Cycling. •	Dynamic Motion Therapy, Active Release, or Deep tissue, cross fiber massage that address personal issues, gleaned from TESTING. In future articles, I will address some of the finer, more precise elements of bike fitting , such as ‘To shim, or not to shim…that is the question’. Stay tuned. Ralph Walker is CEO of John Howard Performance and has 40 years of experience in cycling as a racer, tourist and cyclosportive rider. Ralph has been a certified PowerFiTTE practitioner for 10 years and has multiple other bike fitting certifications. He is ASCM trained as a personal trainer and specializes in incorporating cycling as part of a multi-faceted fitness regime. Ernie Ferrell, DC, CCSP, also contributed to this article.